The Travel Diaries of John Dot: Thailand is the second humorous installment in the Mid Life Backpacker series of comedic travelogues. If you like witty journeys of self-discovery, self-deprecating British humor, and travel writing with a twist, then you’ll love Kevin Kelly’s dry Thai comedy. Buy the book today to see if John Dot survives another unforgettable adventure! 1.0 out of 5 starsKnow that if you read this, it will set your literacy back a century at minimum. I got this for my Kindle because: It was cheap, and, I have been to Thailand so I thought it might be interesting. I was mistaken on the latter point. This is absolutely the worst attempt at writing I have seen in years. The Author should pay people to read it. It is mostly fake, NOT funny when it tries to be, and drifts here and there with no actual story line. 3.0 out of 5 starsThis is Thailand through the eyes of an unassuming traveller. If you enjoy bathroom humor like a ten year old, you will enjoy this. The author is 47? More suited to 20 year olds or less, except they have better command of the language including grammar. The insecurities and immaturity of the author are appalling. Desperately needs an editor. Great reading. Keep a fast pace. John Dot is on his travels again, this time in Thailand. But John is not exactly a confident traveller. In fact, the main reason he’s going on this adventure is because he doesn’t dare tell his therapist that he doesn’t want to! 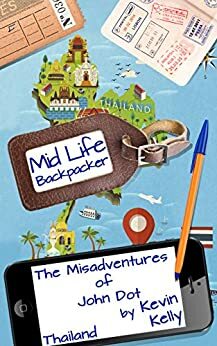 So, grab your boarding pass and get ready to join this obsessive, neurotic, and wonderfully naïve middle-aged Brit for a whirlwind adventure across Thailand. Get ready for plenty of misunderstandings, some toilet humour, and a smattering of cultural insensitivity all threaded through with the, sometimes painfully, dry wit that only a Northerner could produce. I laughed far too much whilst reading this book. Seriously, I’ve never had so many weird looks from strangers – at bus stops, in hospital waiting rooms, and on packed commuter trains. Any future adventures of John Dot will have to be read in the privacy of my own home for fear I am shortly to be declared incurably insane. There are many moments that are cringe-worthy, alongside plenty that make you want to cheer John as he tackles nonsensical situations of a foreign land in the forthright way we wish we dared. Understandably, the humour isn’t going to suit everyone. It will be too ‘low-brow’ for the aspiring literary critics, too irreverent for some millennial backpackers, and too baffling to anyone born more than 100 miles from a ginnel. Oh, and you might not want to show it to your mum…although on second thoughts, do. Honestly, just give it a go. What’s the worst that can happen? It’s not like it’s a menu for a Bangkok ping pong show or a plate of non-conformist breakfast. If John Dot can travel Thailand, you can certainly manage to read about it! My only question now: where will John go next? Disclaimer: I received a free copy of this book from the author and chose to review it to help you decide if it’s the book for you.